This afternoon, news broke that TJ Dillashaw has been suspended for two years for his use of recombinant human erythropoietin (EPO), an “injectable only” drug. “I’m quite familiar with EPO from my days investigating professional cycling teams,” UFC Vice President of Athlete Health and Performance Jeff Novitzky told ESPN of EPO and how it is used. “It’s a very effective substance. It’s not a substance you find in contaminated supplements, it’s injectable only. You have to know what you’re doing when it enters your system. Unsurprisingly, it did not take long for other MMA notables to react to this troubling news. 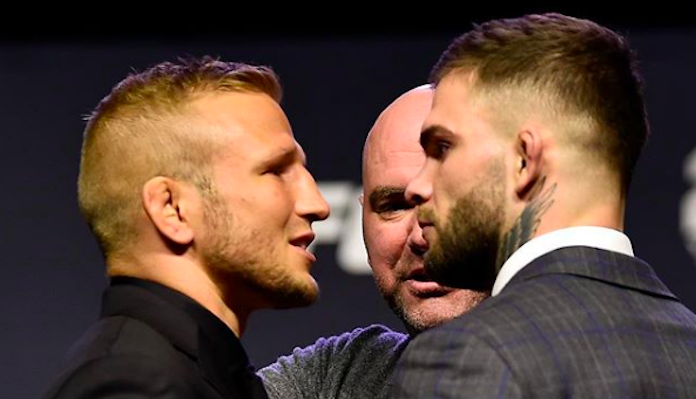 The most notable reaction came from TJ Dillashaw arch nemesis Cody Garbrandt. The pair used to train together at Team Alpha Male, but later entered into one of the most heated rivalries in recent MMA history. EPO? That’s a career ender. Dillashaw is finished. Speaking in a statement released to ESPN, USADA CEO Travis T. Tygart explained why TJ Dillashaw received such a lengthy suspension for his use of EPO.